Every March Hong Kong turns into a rugby haven, with tons of extra foreign tourists. Last year I could only go to a couple of games, 10s matches before the big weekend, but this year P managed to acquire tickets to the finals of the sevens. Getting tickets is actually moderately difficult because they are so limited: you have to win a lottery, buy them off a scalper (or a tout as they are called elsewhere, as I learned this weak), or know someone with a connection. Causeway Bay was filled all Saturday and Sunday with costumed rugby fans rowdily singing and drinking their way through the tournament. I do not know from whence the costume tradition originated, but every year people try to be as ridiculous as possible. Choice costumes this year: baby headed men, shower capped bathers, dozens of yellow and purple minions, Mario party, two statues of Liberty, Waldo, monks, nuns, an assortment of marvel characters, and various racial stereotypes from kimonos to feather headdresses. All these costumed revelers make their way to the South Stand where they watch hours of excellent rugby, dance to blaring music, heckle the French rugby team, and generally enjoy themselves. On Sunday we arrived around 10 til 10 for the final rounds of the tourney: semifinals in the morning followed by the deciding games in the afternoon. I was particularly excited about the American team, even though they got pummeled by the team from Fiji first thing. We managed to yell at the officials and engage in multiple USA chants. We also cheered for the England team in honor of P, who sang songs and gave everyone guidelines for how the games actually work. 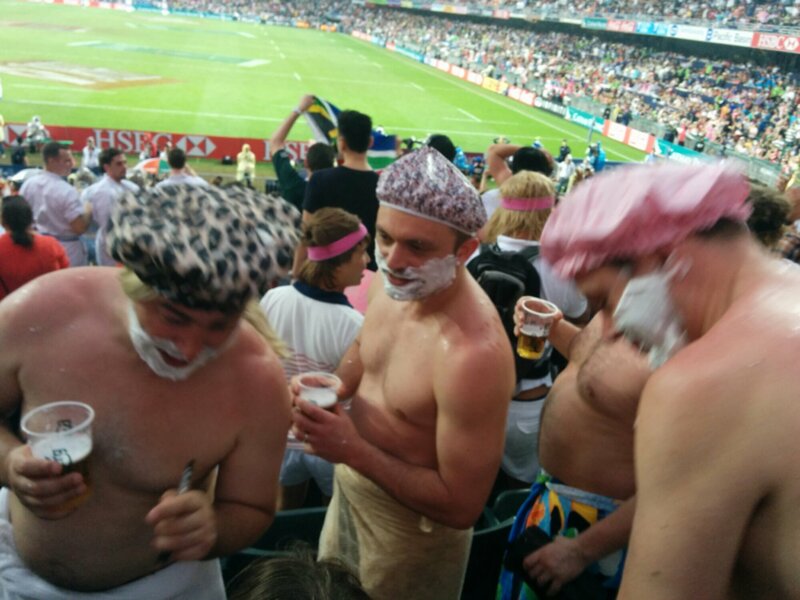 Sunday is the serious rugby day, compared to Saturday where the main point is to party. While Sunday is still a raucous good time, the spectators mostly care about the outcomes. You could tell people actually watch. The final match was England vs the New Zealand All Blacks, and CY Leung even introduced the official song that preceded the game to add an air of officiality that was mostly in the fun. Of course the refs made some interesting calls, and the Kiwi team played slightly more effectively. In the end, New Zealand was victorious, and America lost two games, while our other favorite, England, was second.